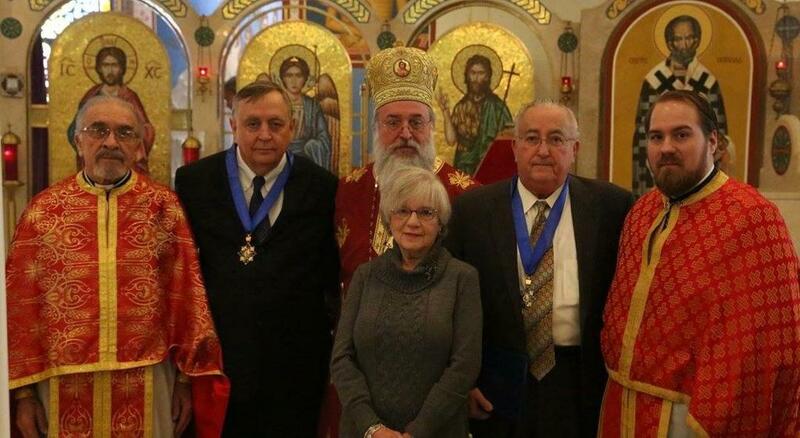 Joliet, IL - Upon the recommendation of His Grace Bishop Longin the Holy Synod of the Serbian Orthodox Church awarded Dr. Howard Grundy and Nick Malinovich with the “St. Sava Order” of the Third Degree and Darlene Jovanovich with the “Carica Milica” Order. Dr. Howard Grundy is the President of the church board at the St. George Serbian Orthodox Church in Joliet, Illinois. He has distinguished himself in devotion and dedication to the parish, as well as being a great contributor. He joined parish in 1995 and ever since he has actively participated in all parish endeavors. His leadership has been very constructive and positive in all aspects of church life. Nick Malinovich was born in Joliet. He was raised in St. George Parish, serving as an altar boy and in many other capacities. He has been on the church board for the last 40 years in various capacities, several times as president and currently serves as the first vice president. He grew together with the parish, participating in all areas and actively supporting all church projects. Beside being active in the local parish Nick has served on the Diocesan and Church National level. He is presently the member of the Diocesan Council and the Central Church Council. Darlene Jovanovich was born in South Chicago, where she grew. She married Radovan Jovanovich, a proud Serb from Joliet. They have three daughters and eight grandchildren. Darlene was active in the St. Archangel Michael Church in South Chicago. With her husband, Radovan Jovanovich, she became active in the St. George parish. They raised three girls in a true Serbian spirit. All their family is very active in the parish. The Jovanovich family are core members of the SSS “Mita Topalovich” in the Joliet parish. Darlene served many years on the church board, once as president. She also served on the Diocesan Council. She is a real leader in the community. We congratulate our honorees and are proud of them. Also, His Grace Bishop Longin, upon the recommendation of the local pastor awarded an Episcopal Gramata to seventeen parishioners of the St. George Parish. The honorees are: Darlene Jovanovich, Vicki P. Dorsey, Alexandra Starcevich, Nancy Cora, Kathy Petkovich, Gayle Shimek, Sophie Anderson, Bonnie Dauer, Nancy Jovanovich, Richard Jovanovich, Josephine Orlovich, Ely Grubisich, Martha Seemann, Ryan Dorsey, Steve Malinovich, David Laketa, Mary Lou Suitca. May God protect them and keep them on the path of righteousness.